Saint Mary Cemetery located in North Tewksbury with its spacious rolling grounds, offers a beautiful and tranquil setting. We offer a choice selection of both monumented and flat marker lots from which to choose. Burial Pre-Arrangements are also available. An Endowed Care Plan is included in the purchase price of burial lots at Saint Mary Cemetery. All burial sites are maintained under the Endowed Care Plan and one need only visit the beautifully manicured grounds to realize the value of this plan. The plan provides the assurance of permanent reverence and respect for the deceased through the tasteful flower gardens and shrubs, shade trees and trimmed lawns adorning the grounds. Making arrangements for a burial place in advance should be no more difficult than providing insurance or having a will. It is a sensible thing to do. By purchasing your place of burial today, you can avoid the unnecessary confusion plus the financial and emotional stress that death often brings. A selection now will give you the comfort in knowing that the matter is settled. Planning ahead has other advantages; you can select from the best locations, and take advantage of our convenient interest free payment plan. Providing for a permanent place of burial now will assure a sense of security to you and your family in the future. St. Mary Cemetery in Tewksbury has dedicated a special area named the Field of Angels for children under the age of one (1) year old. Burial space for the Field of Angels will be donated by St. Mary Cemetery. There will also be no cost to the family for the interment. Prices are effective: AUGUST 16,2016 and are subject to change without notice. Pre-Arranging cemetery opening and burial charges in advance is also good financial planning. It is a sensible thing to do. By Pre-Arranging cemetery charges, you can avoid the unnecessary confusion plus the financial and emotional stress that death often brings. The following is the policy of Saint Mary Cemetery concerning the acceptance of Pre-Arrangement Funds. We will accept a sum of money equal to the following current charges. Payment of the above amount now, guarantees no increase in Cemetery Charges at the time of interment. Pre-Arrangement Funds are placed in a separate account and are withdrawn at the time of the interment. Once a lot has been fully paid for, an interest free Time-Payment Plan on Pre-Arrangements is available. Canopies, Winter Graveside, Holiday and Saturday Overtime are additional charges and are due and payable at the time of the interment. To request a Prepaid Arrangement St Mary Cemetery the cemetery requires that the Prepaid Arrangement Request Form be filled out and notarized. Click here or on the form image on the right to open Prepaid Arrangement Request Form PDF file that you can view or print. The General Laws of the Commonwealth of Massachusetts Chapter 114 govern the Right of Burial in a Cemetery Lot. Click here here for a link to the Chapter 114 Massachusetts Law web site. Call the office for information and or help in determining the requirements for the right of burial in a cemetery lot after the original owner(s) of the lot is/are deceased. If you wish to make Pre-Arrangement Plans, please call the cemetery office at (978) 458-8464 for additional assistance. Burial space in a lot at St Mary Cemetery can be reserved for specific individuals. 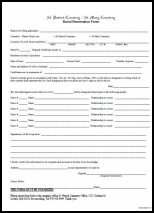 Please use this form to designate in writing the grave number(s), name(s) and relationship to the Original Owner of the Lot. 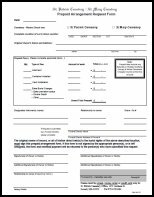 Click here or on the form image on the right to open a Burial Reservation Form PDF file in a new window which you can then view or print. Call the office for information and or help in determining the requirements for the right of burial in a cemetery lot after the original owner(s) of the lot is deceased.